Key cabinet is heavy 18-gauge steel construction, and measures 21" x 20" x 5". 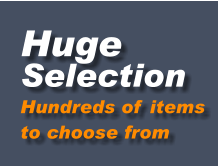 The cabinet holds 96 keys and you can add an additional 96 keys with the optional Key Panel (sold separately - see item below). Color is neutral Light Putty. Features convenient 1" key hooks and the door is piano-hinged. 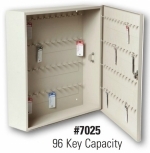 The large key hooks and extra space make this cabinet ideal for large keys with remotes. Each cabinet comes with 2 Cabinet Keys. Packaged one key cabinet per box.